Knottingley Albion veterans team celebrate cup final success. Knottingley Albion Vets put Newland to the sword as they triumphed in the Hull & District Veterans League Division Three Cup final. 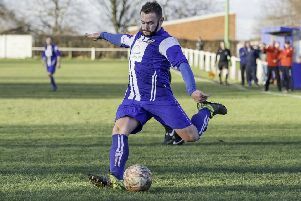 A 4-0 success made it a league and cup double for Albion in their debut year after they had already clinched the Division Three title, finishing four points ahead of Beverley Town with just one defeat all season. Having recently secured the league trophy, Knottingley entered the final with high hopes. But their opponents had not been defeated since October and were the league’s form team. The game began at a frantic pace and it was Albion who were on the back foot in the opening exchanges. For all Newland’s possession in the early stages they did not muster an attempt on goal, though. Lee O’Rourke, in goal, marshalled his back three well and Hook, Agar and Baker did not give a yard. Newland’s midfield was bolstered by former Coventry, Swansea and Wigan midfielder Jamie Bramwell, but any danger of him running the game was thwarted by Paul Fish and Neil Jackson, the hard working midfield duo producing the perfect platform for the majestic Richard Stack to show off his skills. With Harrison and Jaques on the flanks and Hewitt and Dave Pursglove up front Knottingley had more than enough firepower to worry the Newland back line. They went ahead after 25 minutes when Pursglove raced through to round the keeper to score after getting on the end of Jackson’s raking pass. From the restart Newland quickly set about trying to push for an equaliser, but this opened them up and Hewitt had several chances to increase the Albion lead only to find the goalkeeper in good form. Several attempts were fluffed by Pursglove, Baker and Jaques before Stack scored the goal of the game on the stroke of half-time. Albion won a free-kick to the right of the half-way line and all the players lined up ready for a cross. However, the observant Stack saw the keeper edging from his line in anticipation of a cross and let fly from over 50 yards with a thunderous shot which flew over the custodian into the roof of the net. Unchanged for the start of the second half, Knottingley soon increased their lead on 60 minutes. Jackson found the injured Pursglove, who was waiting for support. The support never came so the striker tried his luck and curled a 30-yard shot round two defenders and into the top corner. Hewitt had a number of chances to close out the game, but was unable to convert. Albion introduced Brown, Gaskell, Jones, Harvey, O’Donnell and Smythson and the fresh legs shored up the team. O’Donnell nearly scored, having a volley cleared off the line. Newland managed one shot on target all game, which was tipped on to the bar by O’Rourke. It was left to Stack to have the final say with a thunderbolt from 30 yards which deflected into the net. In an excellent team display, Pursglove took the MOM award.